For a long time audience members have been approaching us after gigs and Ceilidhs wanting CDs. Well now we’re delighted to announce the release of our first CD – a mini-album, comprising 5 choice tracks, approx’ 20 minutes of Tyn Daga at our best. Featuring self-penned tunes and songs, as well as uniquely arranged traditional music from around the world. The album is on sale as a CD available at all Tyn Daga gigs or World Ceilidhs or available online for download. Join in the revelry of this full programme of entertainment at the Guildhall St Ives, Tuesday 16th September from 7.30pm. 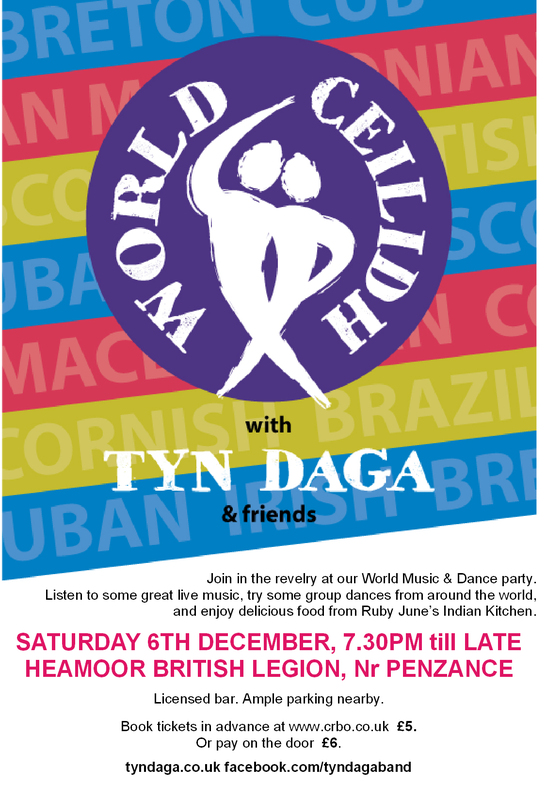 Live world music by Tyn Daga with guests, traditional group dances from a variety of countries led by caller Jo Howard, Latin dances led by Lorraine Furneaux & Catherine Campbell, delicious Mexican and Indian cuisine, plus bar. Tyn Daga will be appearing with Sheelanagig and Jez Hellard and the Djukella Orchestra as part of the Bath Folk festival. Tyn Daga at Holifair, Sat 2nd Aug 2014. 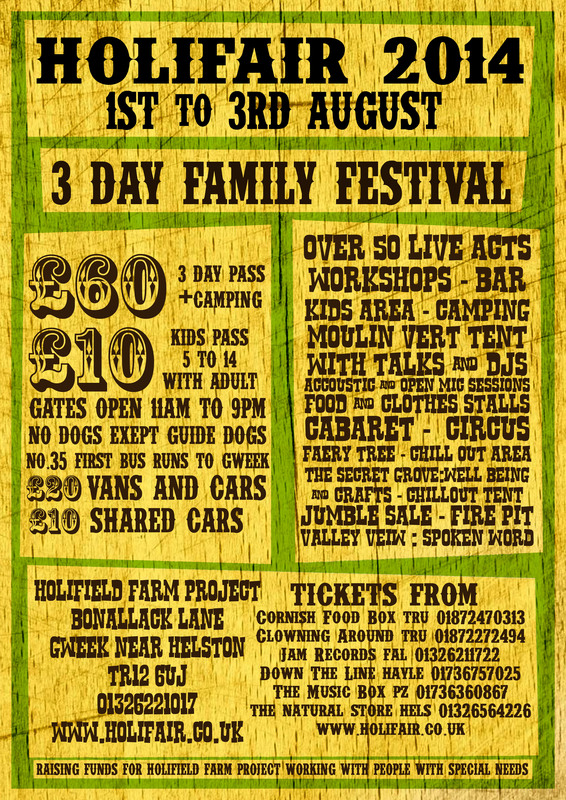 On Saturday 2nd August, we’ll be enjoying playing at Holifair, the delightful music festival near Gweek, Helston. Time to be confirmed but we reckon it’ll be in the afternoon. This fabulous local festival has been going now for some years and hasn’t lost that magic it had in the early days. We’re praying for scorching weather! Tyn Daga plus friends will be appearing at the World Music and Dance night at the Guildhall, Tues 16th Sept as part of the St Ives September Festival. An informal evening of Celtic, Eastern European, South American, Caribbean and African music – and a chance to try a selection of fun, easy introductory group dances led by caller Jo Howard. Doors open 7.30pm for food Delicious world cuisine on sale from Ruby June’s Indian Kitchen and the Ginger Mexican. Licensed bar. Tickets from info@tyndaga.co.uk or contact us through our facebook page or on the door. Golowan – Quay day gigs – Sunday 29th June. As part of Golowan celebrations, we’ll be appearing twice on the Bag’o’Rags stage (by the Pirate ship in the wet dock, Penzance Harbour) on Quay Day, Sunday the 29th.